A few weeks ago, a recipe on Boston.com caught my eye… so I book-marked it and surfed on my merry way. A few weeks later, we decided to have some friends over for dinner. I immediately thought of the recipe, as I wanted to cook some good ‘ole fashioned Fall comfort food. 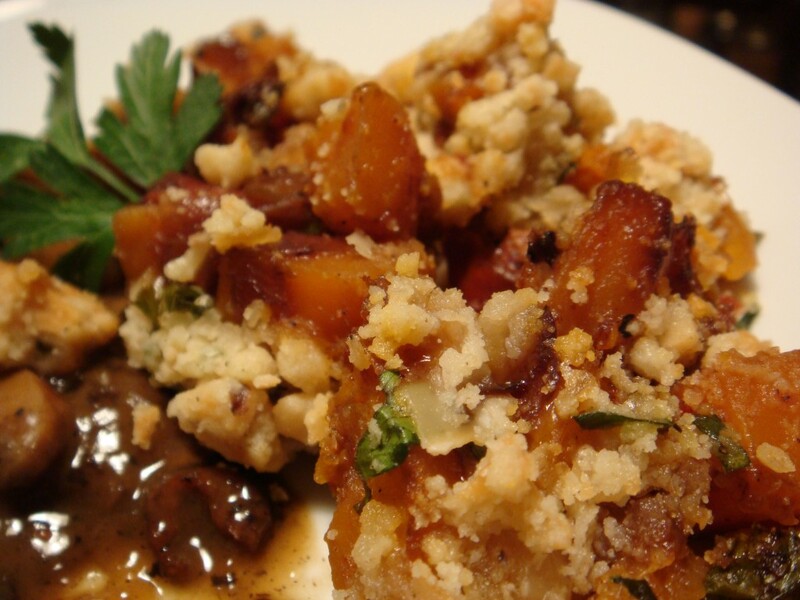 It was a recipe for Butternut Squash Crumble… and it sounded delicious. I loved the idea of taking a traditional sweet crumble recipe and adjusting it to turn out a savory side dish. Courtesy of the Boston Globe… written by one of my favorite blog authors. In a bowl, combine the flour, walnuts, parsley, Parmesan, and a generous sprinkle of pepper. Add the butter and work with your fingertips until the mixture forms coarse crumbs. Cover and refrigerate. Generously butter a 10-inch baking dish. In a large skillet over medium heat, heat the olive oil. Add the butter and when it melts, cook the onion, coriander, and bay leaf, stirring occasionally, for 3 minutes or until softened. Add the tomatoes and cook for 3 more minutes. Add the butternut squash, sage, salt, and pepper. Turn down the heat. Cover and cook for 30 minutes or until the vegetables soften. Set the oven at 350. Discard the bay leaf from the squash mixture. Sprinkle with parsley and Parmesan; stir gently. Transfer the vegetables to the baking dish. Spoon the crumble mixture on top. Bake for 30 to 35 minutes or until the top is golden. It’s not a great picture, but this was the final result. I should have taken some photos while I was making it, but the thought didn’t cross my mind. In any case, this dish was extremely good. The savory crumble top was buttery with a slight crunch and the butternut was sweet (without being too sweet) and savory at the same time and incredibly tender. A definite keeper (even though it’s not even close to being low cal/low fat! ).